Councils throughout the United Kingdom are voicing concern about fire risks involved with purchasing cheap and potentially fake laptop or phone chargers. Wandsworth council late last year are the newest in a growing list of councils that have sent trading standards officers to stores peddling illegal or unsafe laptop chargers which risk possible fire, sometimes as early as the first time the power supply is used. More than two hundred chargers obtained by Wandsworth council alone failed basic safety tests, in growing examples of manufacturers and retailers trying to cut costs as much as possible to offer cheaper products to consumers – sometimes at a safety risk. Defects that were found included circuits poorly soldered, not enough insulation between the output and input circuits, and components inside the unsafe laptop charger not being secured correctly which could lead to fires or electric shocks. 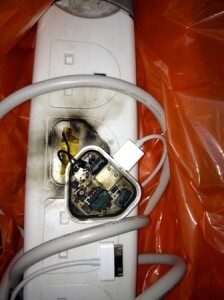 Wandsworth council’s consumer safety spokesman Councillor Jonathan Cook stated: “Our trading standards team have acted swiftly and decisively to protect residents from these dangerous chargers. You can see the original article on the Wandsworth Council website here. If you are looking for a genuine, branded, safe and reliable replacement for a Dell laptop charger or for any other major laptop manufacturer, Imperial Gadgets are able to supply functional, safe chargers that can also charge multiple devices. A year warranty on all our products comes as standard for your peace of mind.